Go back to Europe page. 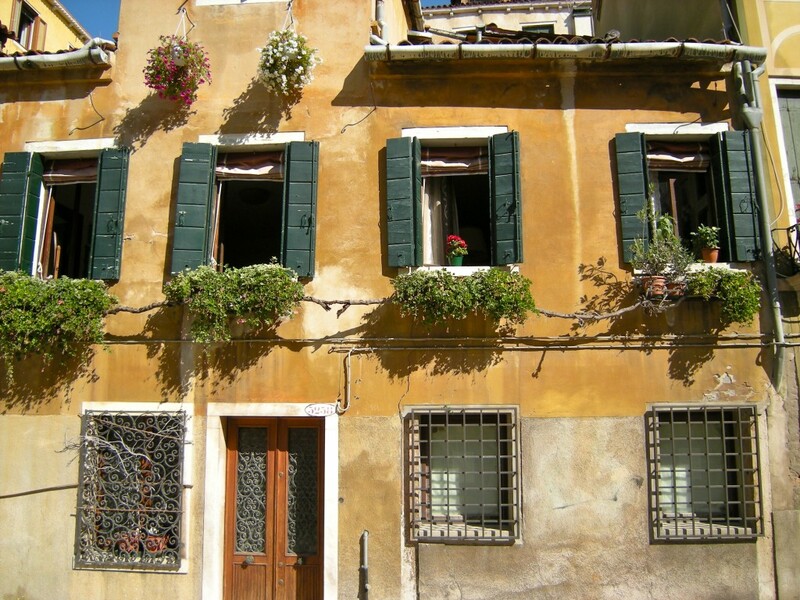 So there we were – sitting around the kitchen table shaking our heads in a merry disbelief. Ahead of us lay a stretch of free time we’ve never faced before: 8 weeks! It was finally here. We had spent the last few months prior trying to decide how exactly to burn it – use it for going back to some familiar places around the western United States and trying to dispatch some of our bigger goals or try something different? Though initially leaning toward the former, in the end (and with the suggestion of our friends) we went for the latter. Yes Sir! A two-month circuit of stamp-collecting conventions it was going to be!! Our climbing trip started with a whole shitload of driving (two shitloads in fact!) and little climbing. Drove down to California only to fail. Drove back up to Portland. Picked up our dog Blondie and spent the next three days driving the 3000 miles to the east coast where Blondie would spend the summer with my parents. A week into our trip and the only thing we really succeeded on was climbing my parents’ roof (to fix a leaky tile) – a project that I initially felt would go at 5.7 R (slab) but the roof material proved too slippery and the challenge was eventually solved A0-style ala FA of Lost Arrow Spire. Shirley getting used to the idea of rapping off of single ring bolts on the north face of Torre Venezia….a fashion trend we’d see quite a bit on European routes (August 2008). With this boost in our climbing confidence (not to mention a sealed leak) we set off for Europe via Newark, Amsterdam, and eventually Venice where we spent 3 days sightseeing while being squeezed to death by the crowds. Finally we picked up our tiny rental car and my brief Euro-driving career began and ended in the rental parking lot where I stole on take off and endured much verbal and sign language abuse from an irate Italian driver. 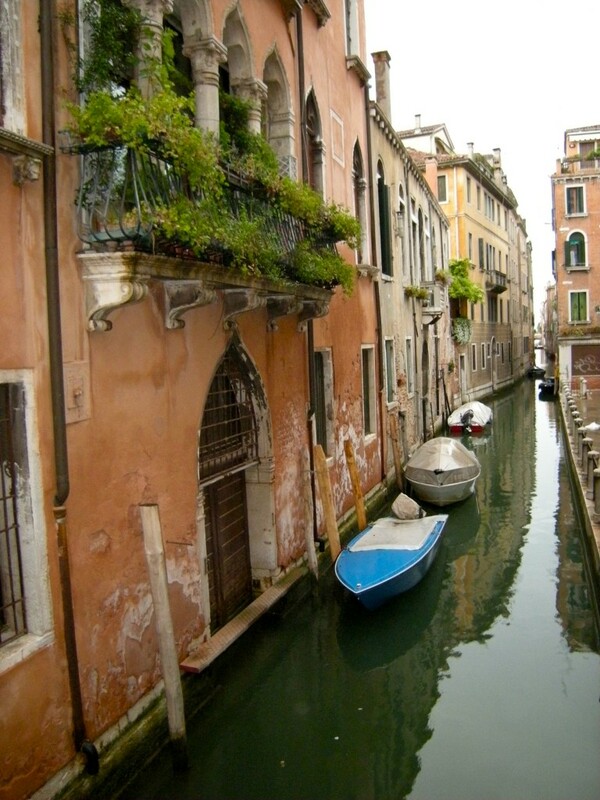 From here on, Shirley did all the driving in Europe with her superior manual transmission skills. 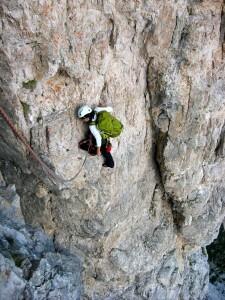 Later that day we were in Castelrotto planning our first day of Dolomite climbing. 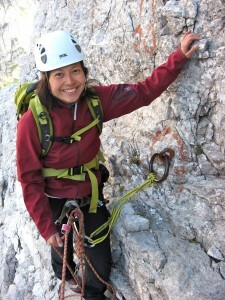 Leading the super fun traverse pitch (#8) on the Pillar Rib (Aug. 2008). 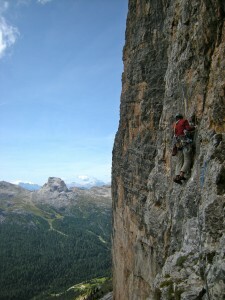 Classic Rock Climbs in the Dolomites by Anette Kohler & Norbert Memmel. ISBN-10: 1898573344; ISBN-13: 978-1898573340. 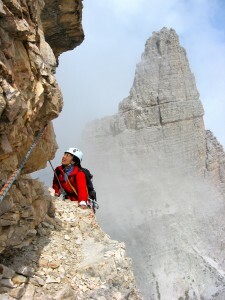 Shirley nearing the top of the chimney pitches (this is roughly #13) on Tissi/Andrich/Bortoli (VI-, 15P) route on Torre Venezia’s south face (Aug. 2008). 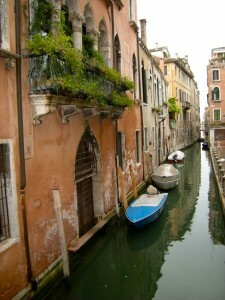 Good morning Venice...of course it's raining (Aug. 2008). 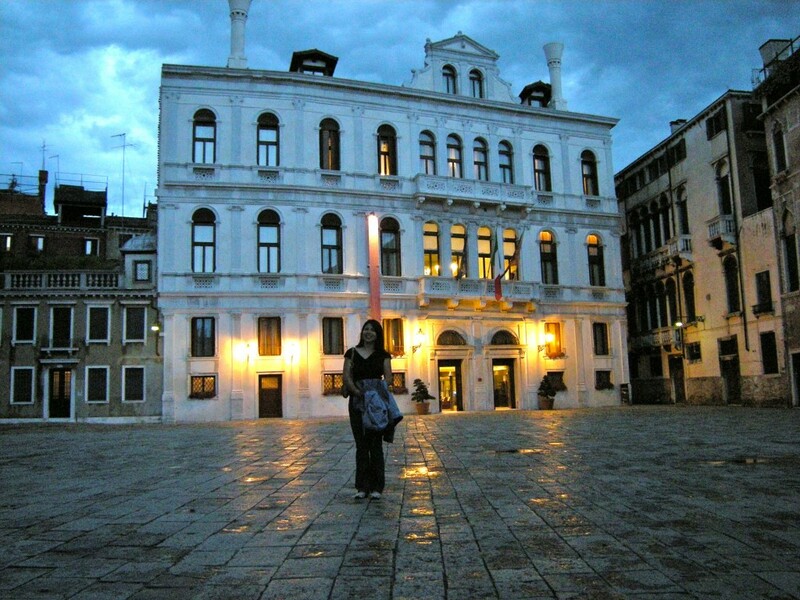 Shirley strolling through Venice at the tail end of our first day in Europe (Aug. 2008). 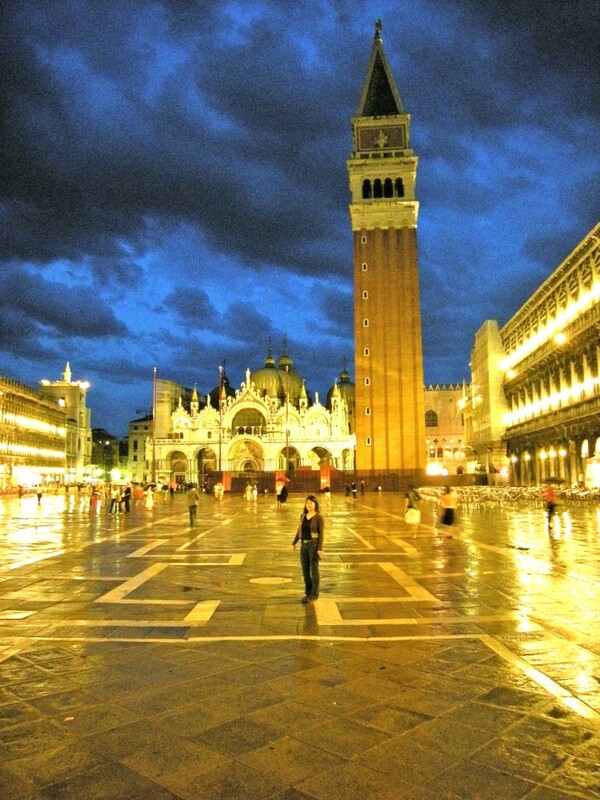 St. Mark's Square in Venice on a stormy evening (Aug. 2008). 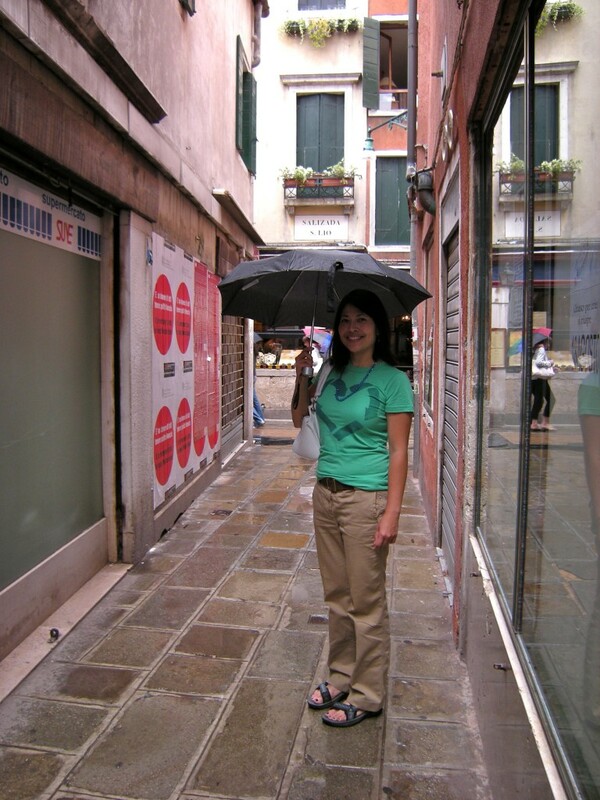 Shirley experiencing the gelato overload in Venice (Aug. 2008). 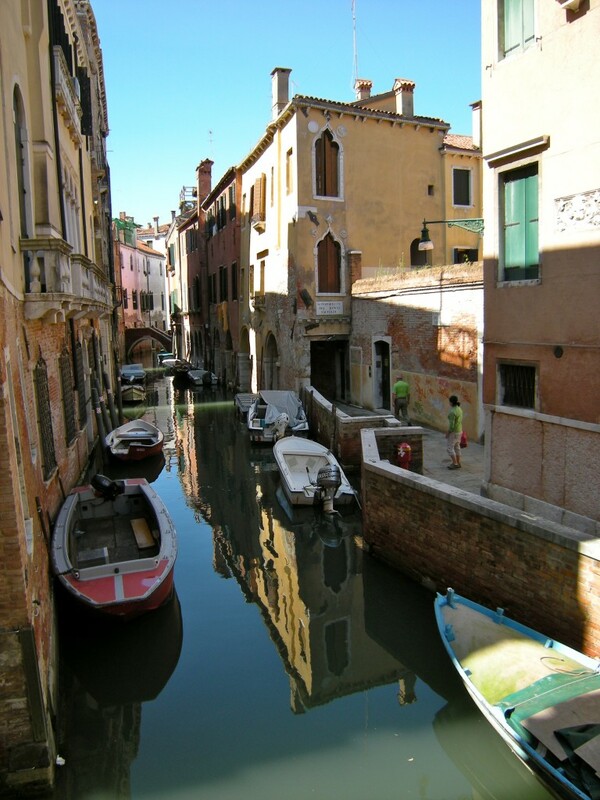 Strolling aimlessly through the streets of Venice (Aug. 2008). 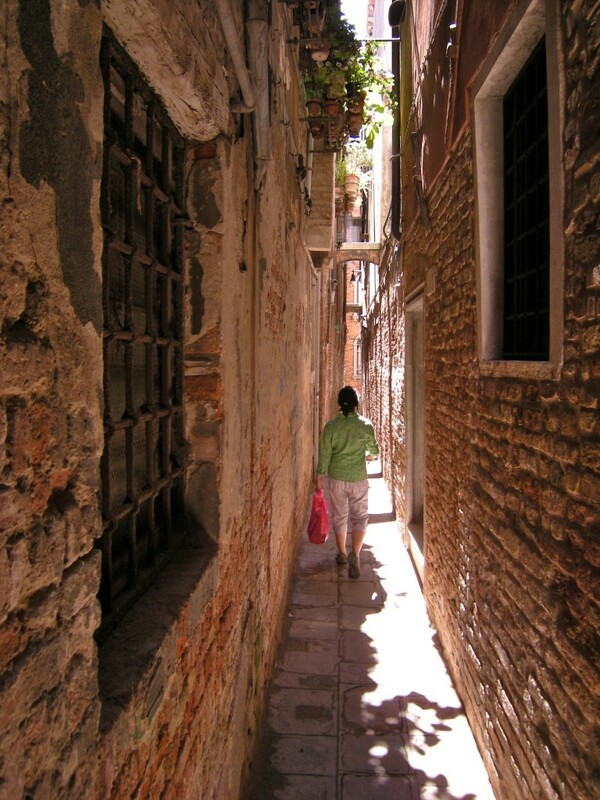 Through narrow alleyways (Aug. 2008). 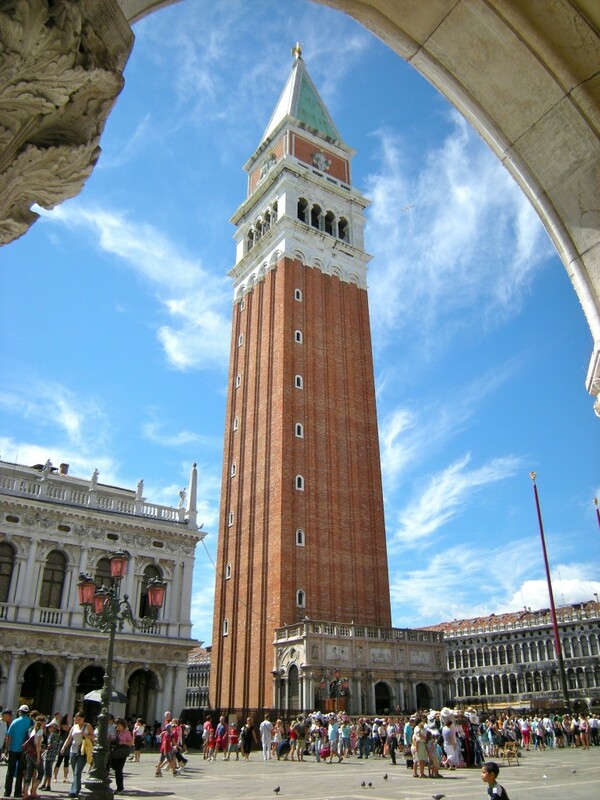 The "Campanile" (Tower?) 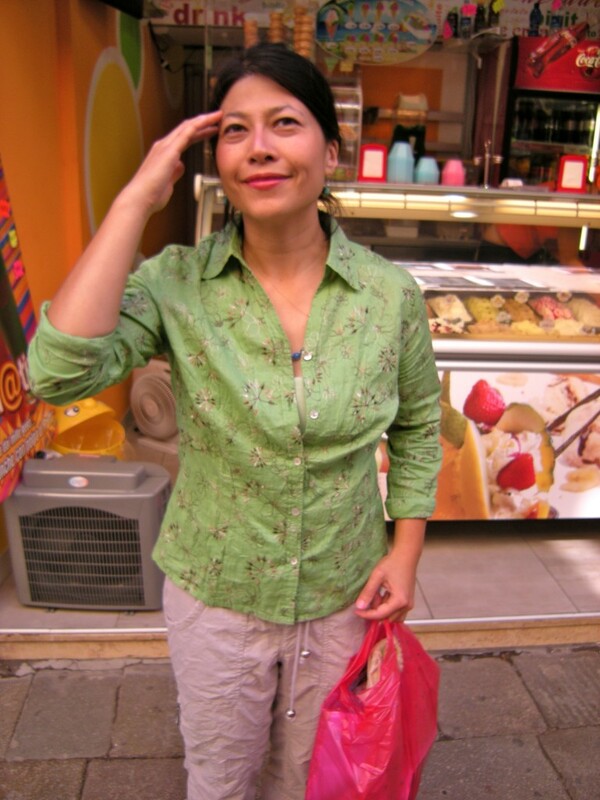 in St. Mark's Place (Aug. 2008). 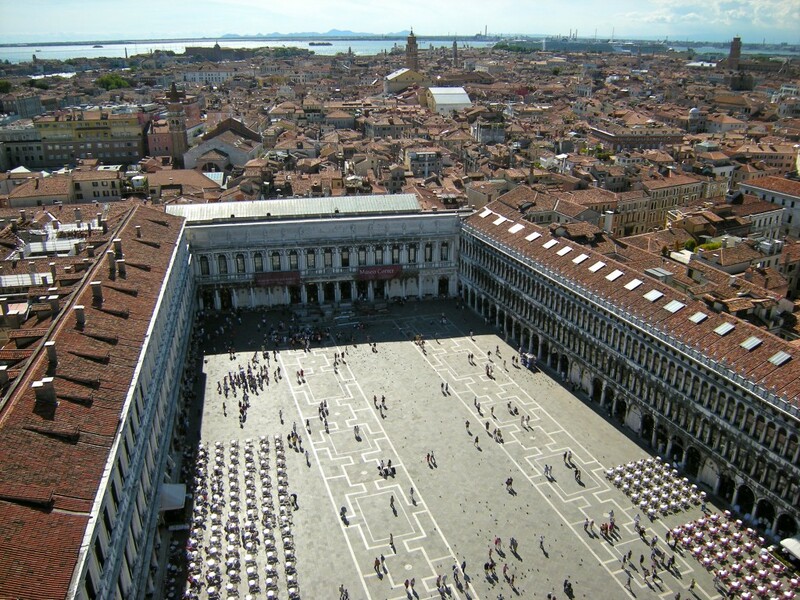 View west from the top of the tower in St. Mark's Square (Aug. 2008). 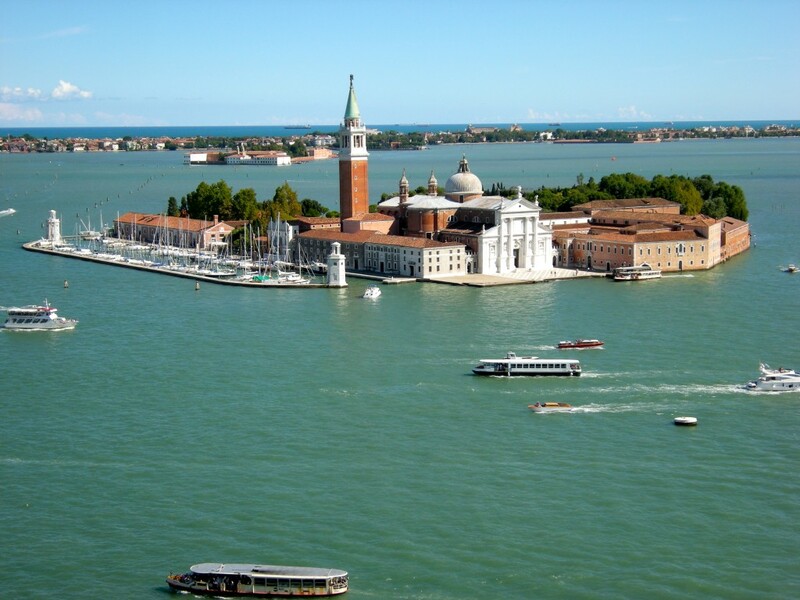 Venice's Lagoon as seen from the top of the Tower in St. Mark's Square (Aug. 2008). 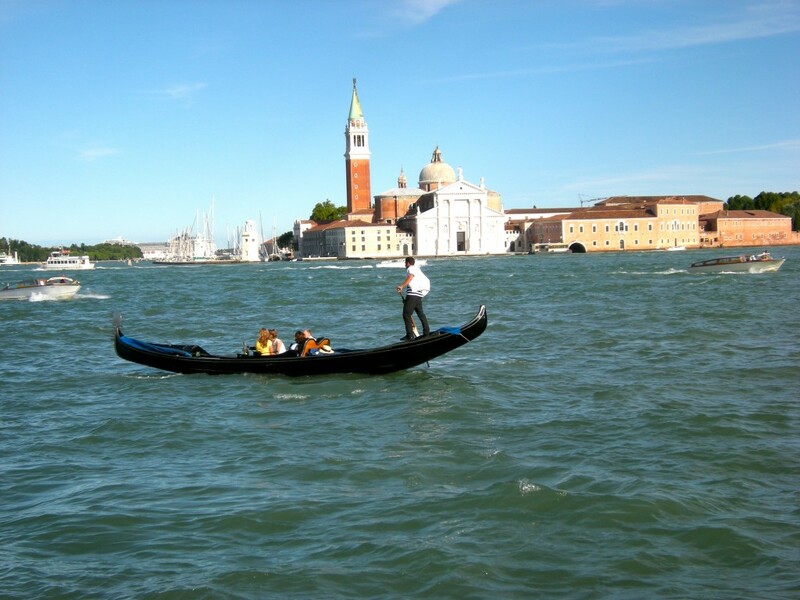 Some chunky tourists trying to sink a gondola (Aug. 2008). 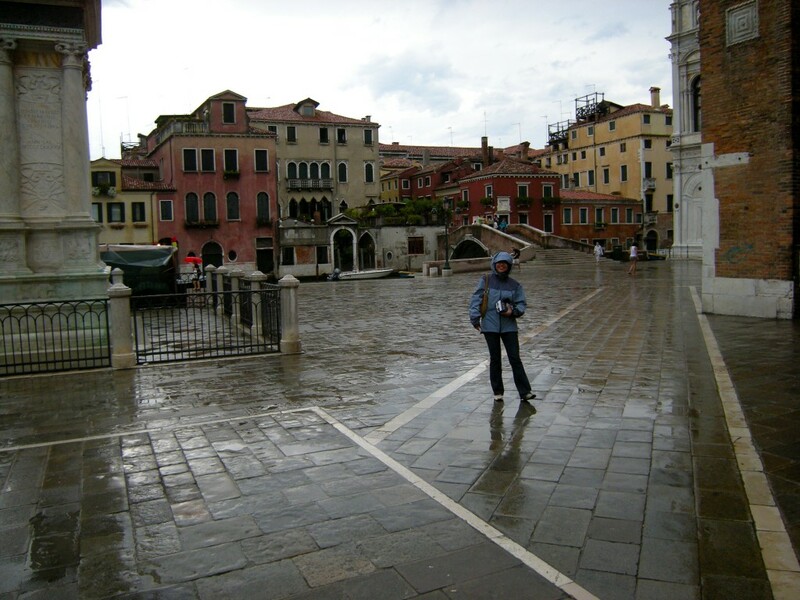 Shirley in a rainy Venice (Aug. 2008). 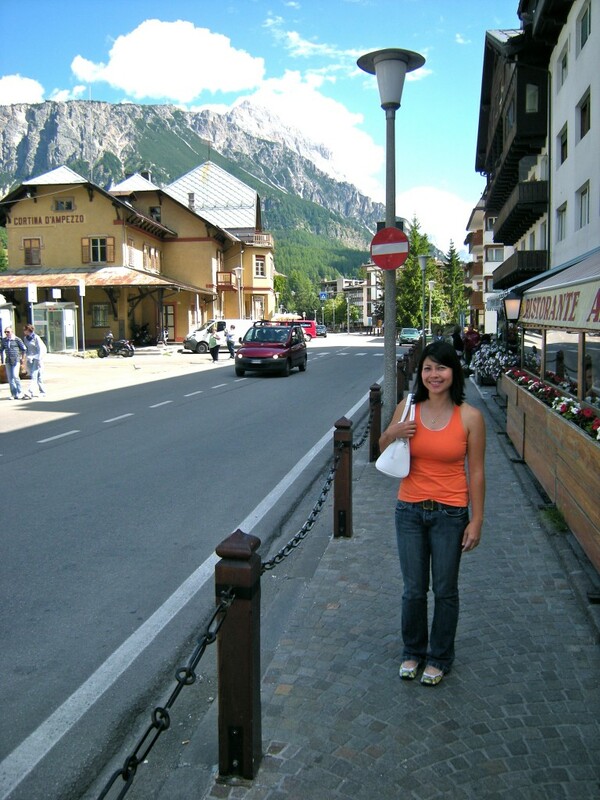 Shirley in Cortina D'Ampezzo - another tourist trap but at least we're getting closer to the climbing (Aug. 2008). Go to Euro Sampler – Meteora page.